Unniappam has almost the same ingredients as neiyappam, with a slight variation of adding mashed ripe bananas and fried in coconut oil. It can also be deep-fried in ghee. Unniappam is a traditional kerala prasadam in temples and also offered to the Lord during festivals. Dry ginger powder / Sukku podi - 1 tsp. Chopped Coconut bits - 3 tsp. Dry roast the rice flour until hot. Heat a ladle of water, melt jaggery, strain the impurities, keep aside. Mash the bananas. Ghee fry the coconut bits. Dry roast the sesame seeds. 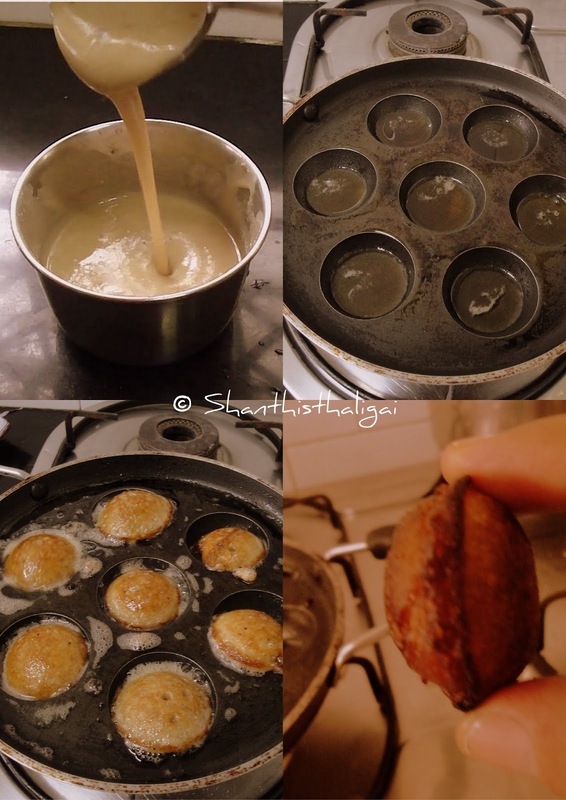 Mix rice powder, jaggery syrup, mashed banana and grind together to form a semi-thick, smooth batter. (Add water as and when needed). Add fried coconut bits, sesame seeds, dry ginger powder, cardamom powder and mix well. Heat coconut oil or ghee in an "appakaral"(appam mould), pour the batter to 3/4th of the holes. Ensure medium heat. When the bottom portion is light brown in colour, flip with stick or spoon to the other side and cook until golden brown on both sides. Take them out and drain in a kitchen towel. Pour some more ghee / oil while doing the next batch. Kerala unniappam is ready to offer to the Lord. Do not keep the stove in high flame. Be careful not to burn the appams. Make sure to have ghee/oil in each of the hole while making the other batches. I love these appams.Only I do not get them in shops.It seems very simple to make. Timely post.Going to make this for Srijayanthi. Thank you. Why is rice flour dry roasted?